I laughed at the question. No. No, I’m not claustrophobic. But, they kept asking. I answered the same way every time, but it was starting to make me wonder. Good thing I wasn’t afraid of small places. My arm hurts. Not all the time, but often enough when I turn a particular way, or when I try to move it to a certain position (like the position I need it in to use my mouse and keyboard.) A slight shift of position and a conscious effort to turn my head left generally relieves the pain. A few times I have forced it to stay — just. . .need. . .to. . .finish. . .this. . .sen. . .ten. . .ce. . In those cases, it hurts. . .a lot. I worried about my trip to Southern Utah last weekend. 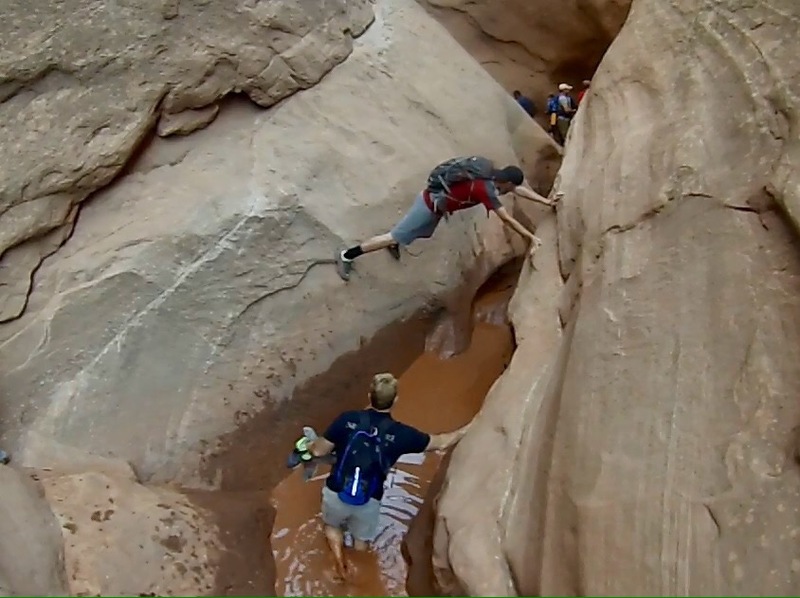 Climbing like this means you CANNOT move your arm. Not unless you want to take a swim. The doctor’s initial diagnoses was not my shoulder, but a problem with my neck. (Sadly, she didn’t use the phrase it was a pain-in-the-neck.) She scheduled me for an MRI to be sure. One of the side effects of the new healthcare law is that at the end of the year, if you have a big family, you have typically met your “out of pocket” maximum. So, $1000 medical procedure? Sure, let’s do it. The test was scheduled for yesterday. I’ve also gotten out of the habit of going to the dentist. Not because I’m afraid of small places. . .I mean, not because I’m afraid of the dentist. I just got off track. And no, I’m not claustrophobic. I had a dentist appointment scheduled for yesterday as well. The MRI was first thing in the morning and the dentist was after I got off work in the evening. As I checked in for my appointment at the hospital, they had me answer a series of questions. Do you have any metal in your body? Have you ever had an MRI done in the past? Do small spaces make you uncomfortable? It’s just routine. We need to ask. Oh and any issues with claustrophobia? You’ve probably seen pictures of an MRI machine. They lay you on a table and slide you inside a big machine that will take a 3D picture of your spine, or whatever part they need to look at. My lovely wife had done the procedure in the past. Just close your eyes so you don’t have to look at the tube that is about 4 inches above your face. Right. Like I need help to get through this. The snow caves we built last winter were pretty small. The ceiling was a few inches above my face an I did just fine. No problem. The technician had some final instructions. Here are some earplugs. It can get pretty loud in there. And if you need anything just talk normally. I can hear what you are saying even from the control room. You’re okay with small spaces? I laid on the table and placed my head between two pieces of plastic designed to keep it perfectly straight. Next, he placed a plastic guard over my face. I closed my eyes and tried not to think about it. Intentionally, I hadn’t looked at the tiny hole that they were going to feed me into like sliding a pizza into an oven. Just relax. It’s just like a snow cave. Keep your eyes closed. You won’t even know when you are in there. The table jerked slightly as it started to roll in. The ambient light through my eyelids abruptly turned black. That’s totally fine. Should have expected it. My elbows brushed against the sides of the tube as my upper body made it’s way in. My elbows? They were tucked in pretty close. It’s even smaller than I thought. Brea. . .I just need need one good deep brea. . . Okay. Calm down. This is silly. The technician removed the plastic faceguard and I sat up and drank in the oxygen that was so much thinner inside the machine. I’m not claustrophobic, but what do you typically do for people who are? Well, we can put a washcloth over your face so that you can’t see the inside of the tube. That often helps. Or, we can cancel today and you can get a prescription for valium from your doctor and then come back. You typically need someone to drive you because you’ll be pretty hammered. Or, there’s a place not too far from here that has a machine like this but half of it is cut away. It’s designed for obese patients, but some people are more comfortable with that. Do we need to reschedule this? No. I’m fine. I just need to know, if I had to, could I climb out of that machine? Sure. I do the same thing. Once I know I can get out, I’m okay with it. The machine is open on both ends. If you needed to you could crawl out the other end. Okay. I think I’m ready. Do you want the washcloth over your face? Here, hold this sensor just in case. If for some reason I can’t hear you, squeeze this ball and it will shut down the machine. What, what? Can’t hear me? I laid back down and the technician readjusted the face mask. I held the panic trigger in my hand althought I knew I wouldn’t need it. I remembered to tuck my elbows in tight. The movement of the bed was expected. And because it was expected, It wasn’t scary. I started the relaxation breathing that I’d practiced from the time I was a teenager to get through the pain and discomfort of procedures around treating Crohn’s disease. The rattling of the machine had a certain techno-punk beat to it that was not all together unpleasant. Just knowing that I had an escape route reassured me that I didn’t need one. Later, as I laid back in the dentist chair, I thought again about escape routes. The “tiny prick” of the mammoth needle putting in the Novacane that makes your face feel like it’s sliding down the side of your skull. The “mouthguard” that locks your jaw at a 180 degree angle and forces you to swallow in tiny gurgles. Maybe it was the familiarity. Maybe it was knowing that the dentist was right there to stop if I needed him to. Maybe it was the fact that I asked for this procedure. Maybe it was the realization that I cannot always be in control. I’m now less certain of my answer to “Are you claustrophobic?” Oh, and I still cannot feel my face.